I usually have a similar problem too with choosing an image when I shoot only a few, but 86 Mike? That is a very low number. I averaged 142 per day! Gorgeous!! I love the reflection from the clouds above. I might like it better than your striking night sky. There is a nice balance and creative lines that I love! It is wonderfully serene and a very strong recommendation for this software – very beautiful. very nice. I would be interested in knowing how much the software changes the original. Hi Michael, yes I like it too. Reflections are great! The only images I shot all weekend were portraits nothing cool like this! Enjoy your week mate. Thanks David, I think that all I got this weekend were photos of my daughter 🙂 Have a great week, thanks for stopping by. 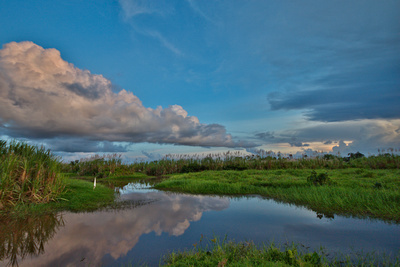 Love the reflection of clouds in this composition. There is a great contrast between the blue skies and lush green grass in the foreground.